My parents were born into a world mostly without cars, but that changed rapidly. When I asked my mother about those cast iron hitching posts that still stood along Western Avenue, she said they were just something no longer needed and would soon be gone forever. Cars were the big thing, everybody had to have one, everybody talked about cars. My father bought his right after World War I, and had to be taught how to work the gear shift before he could even get it out of the showroom. Long before I arrived on the scene, he actually drove a cab. “A cop stopped me once,” he told me. He meant a beat cop, directing traffic on foot. My father rolled down the window, placed a single dollar bill in the cop’s outstretched hand, and, drove on. If my father became a driver very quickly, he became a good driver never at all. He navigated the reaches of Chicago simply by aiming, speeding up and coasting in hopes this would somehow save fuel. Before the Great Depression, he worked for an automobile dealer, the lost “good job” my mother sometimes talked about, but he had been a suit and tie accountant who never quite understood the complexities of the automobile, or even how to buy a good one. 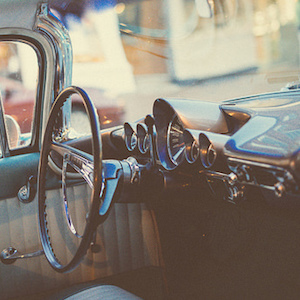 My father’s cars have no shapes in my memory, no colors, no years or models. One famous old rust bucket had to be pushed off the dealer’s lot before it could be driven away, and it was hardly worse than any of the other wobbly-wheeled, gear-grinding wrecks he brought home. Imagine cross-eyed headlights, bald tires and multi-colored inner-tube patches. Now think of hissing radiators, fumes that fill the back seat, and batteries that freeze up on the first winter day and never come to life again. When there were no cars, there was public transportation, a single bus line that ran down Western Avenue and stopped at the Chicago City limits. The Rock Island and Illinois Central Railroads had stations not far from Western, and both would drop you off in the Loop. From there you could ride the trolley, which I remember chiefly because it too always made me car sick. “Don’t think about it, and it won’t happen,” my mother insisted. But I always thought about it and it always happened. Chicago seemed a frightful place, everything made of brick and concrete, treeless, lifeless, inhuman, not quite the city I know today. I got lost one afternoon, and wandered block after block after identical block, and finally was found in the police station, sitting on the sergeant’s desk, eating an ice-cream cone. That was the story my parents told; I remember only those grim endless blocks, and helplessly running my hands along the metal chains people used to fence off their parkways. What I remember best about my grandparents’ house was that it was covered with stucco, and seemed unbearably dark inside. If my Aunt Flo was not home to answer the doorbell, my father would stomp on the porch floor to alert his deaf-mute parents. “They feel the vibrations,” my mother explained. My grandparents were kindly white-haired people who had been born to immigrant parents shortly after the Civil War. Only my grandmother could speak, albeit in a tiny doll-like voice I found difficult to understand. Sign language was used, and when my father and his sisters visited, they would speak aloud to each other while they made the signs for their parents. My father’s sisters were intelligent educated women, several taught school, all were beautiful, even Aunt Flo, the “old maid” of the family. They worshiped my father, which my mother thought was very foolish of them. “They should know him like I do,” she would say. Everybody’s favorite aunt was Gertie, who smoked red-tipped cigarettes and played the piano with oranges in her hands, and somehow produced tunes. She taught kindergarten and kept order by threatening to flush bad children down the toilet, and she feuded famously with Flo, claiming Flo “feared there was a man hiding under her bed” and was disappointed every time she looked. Flo disapproved of Gertie’s lifestyle, which included men, divorce, and things not spoken of when children were around. A devout Catholic, Flo handed out holy cards to children on their birthdays. Like Gertie, she played the piano, but not with oranges. Everyone played. We children were expected to perform for our grandparents as well. “They feel the music,” my mother insisted, which was probably better than hearing the noises I actually made. My sister and I were given little alphabet cards and encouraged to speak in signs to our grandparents. My grandfather had a trick that seemed to please everyone. He would offer a nickel and a dime for my sister and me to choose, and I would always choose the nickel because it was the largest. How old could I have been to fall for that? All our aunts would occasionally visit us in Blue Island, not an easy journey by train and bus, but they would make it. Once the adventurous Gertie stepped through our kitchen door unwittingly bringing a rat in behind her. To make matters worse our dog Trixie, who liked nothing better than to bite a rat, bit that rat and bit it hard. Drops of blood flew onto Gertie’s fine silk stockings, blood she gamely wiped away without a complaint. She would not say one word against her brother. There was a final sibling, my Uncle Tom, youngest of the nine, who actually went to medical school, and became a doctor of considerable renown. My father wished us to believe Tom had worked his way through college, washing dishes; young people from poor families could do that, he insisted, but I believe Aunt Flo and her sisters may have had something to do with it. I remember Tom, just out of school and easily prevailed upon, bringing his little black bag to our apartment and inoculating us children without so much as a word of warning. “How wonderful of Tom to do that for nothing,” my mother said, but I knew my father had tricked him into it, just as he had tricked us into believing this would be a nice family visit. At the sight of the needle, I dived beneath the table and had to be dragged out screaming, and may even have kicked someone, although let us hope this is not entirely true. I do confess I failed to appreciate these remarkable people when I had the chance. My father’s family seemed alien to me, more Irish than I could ever be. I was uncomfortable in that dark house covered with its sharp dangerous stucco, occupied by those ever silent grandparents, and all those school-teaching aunts; even the piano had a curious tone all of its own that I cannot begin to describe, but am always reminded of when I hear the works of Schumann. Come back to Blue Island and see us as we once were, the father, stiff and robotic behind the wheel, the mother, steadily growing stouter, beside him, the children in back, the boy, the sister, and now the little sister they both so diligently ignore. He parks the car on Grove Street but does not go upstairs with the family. He has errands, an office to sweep out, a hot water heater to attend; there is a place waiting for him at the card table. The children follow their mother up the stairs and let the dog out onto the adjoining roof. What a good dog she is, she can “hold it for days” the mother believes. The roof is a large tar-covered rectangle that covers a wholesale tobacco dealer, bordered by a narrow concrete ledge the good dog, Trixie, walks on without fear. She is a terrier mix of some kind, a “rat terrier” the mother says, and you can believe this when you see the way she tears into the rats. She worships the mother, this good dog, and will do exactly what she is told so long as she is allowed to bite the rats, and yet it is the father who saved her life, found her in an alley, a broken stray, and brought her home. The children remember awakening that morning to find her under the sink, crudely bandaged, but alive. Now she walks the ledge of the roof, barking at people below if she does not like them, but taking care not to make a nuisance of herself. The roof is a wonderful liberating place, safe from the street below, open to the sky above. The boy I once was steps into the twilight and waits while Trixie “does her business.” He and his sister are permitted to play on the roof so long as they do not get too close to the edge and frighten their mother. Cars rattle by on Grove, on Western, black boxy things with running boards and flat windshields. Who is in them, where are they going, why? The sun sinks swiftly beneath the horizon, and stars take shape in the summer sky. There are millions, the boy has been told, and all of them have been placed there by God. He hears crickets in the weeds behind the alley, and the trains that are a constant in this town, their long slow whistles in the minor keys. On some nights he hears his father’s voice in conversation with other men somewhere up on Western. His father had a voice that carries, a voice, a laugh, even a cough the boy always recognizes, and all travel clearly through the night. “Come in,” the mother orders, and the boy follows Trixie into the apartment. How wonderful the night is, how wonderful the sky. “Why can’t we have a car with a rumble-seat?” he asks his mother, as he has asked her so many times. Surely, in a rumble-seat, in the open air, not cooped up with all the fumes, he would never get sick. “No,” she says, as if it were the most ridiculous idea on earth. She cannot even imagine why someone would want something like that. Paul Pekin was born in Blue Island, Illinois, moved to Chicago in 1959, owned and operated a small store, taught writing at Columbia College and the School of the Art Institute of Chicago, worked as a police officer for Cook County, and is now retired. His work has appeared in The Chicago Tribune, The Chicago Reader and many literary and commercial magazines, including Cavalier, Swank, Other Voices, The South Dakota Review, and Sou'wester. 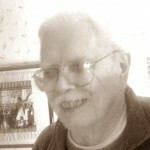 He has won awards from the Illinois Arts Council and the Chicago Headline Club for his fiction and nonfiction.